“Hey, Bill, can we trade instruments and make a lot of noise?” It’s not the kind of request I would normally go for, much as I value student voice, but I knew it was Thursday evening and the lead singer for the middle school rock band was still on their way, having gotten out of theatre rehearsal late and needing to grab a quick dinner. I said, “Let’s do it!” The kids shouted happily and jumped up and ran, practically running each other over, eventually settling into place. I counted off - 1, 2, 1 2 3 4 - and the grand and joyous cacophony began. Last night, the lead singer had to cancel at the last minute for an unscheduled after-dinner theatre rehearsal. The kids were tired and a little down, and after about 25 minutes, one of them uncharacteristically asked if they could leave early. Another, bless her, suggested they reprise the random instrument cacophony, and so we did. Only this time, as I watched the kids happily and randomly flailing at their new instruments as the temporary singer somehow managed to never hit the downbeat nor necessarily the pitch, tears sprang to my eyes. They were so young, so happy, so carefree, so exuberant in their silliness, just like kids should be. A youthfulness, happiness, lightheartedness, exuberance, and silliness forever denied to Alyssa Aldaheff, Martin Duquet, Anguaiano Nicholas Dworet, Jamie Guttenberg, Luke Hoyer, Cara Loughran, Gina Montalto, Joaquin Oliver, Alaina Petty, Meadow Pollack, Helena Ramsay, Alex Schachter, Carmen Schentrup, and Peter Wang when their lives, along with those of their teachers Scott Beigel, Aaron Feis, and Chris Hixon were ended prematurely in Parkland, Florida. And were my kids to be threatened, I would have no way of knowing whether I could give them the protection they needed and deserved. I pulled myself together before any of the kids noticed. As I told a friend, I don’t mind at all their knowing I love them that much - in fact, I tell them outright how much I love them - but I didn’t want them to try and comfort me when the love and care needed to be flowing from me to them. Later that night, I was supposed to be finishing up advisory letters, but I was too angry, sad, and despondent to focus on anything but Parkland. I was not alone. Far from it. Some of my friends who teach were almost incoherent in their grief, others vehement in their anger, others sobbing and/or reaching out for strength, still others just plain numb. Some lay awake in shock until the wee hours, others feared another night full of nightmares. I flew around the Internet, comforting this friend, offering a resource to that one, correcting and reframing and trying my best to be polite in discussions about how to reduce gun violence as I insisted we all remain rooted both in actual facts and in a commitment to action. I signed up to be a Sandy Hook Promise Leader. I shared back out Windsor’s blog she’d written the day before and took comfort in her powerful brilliance. I cried. I swore. I cried some more. Eventually, somehow, I finished up my letters and stayed up until I was so exhausted I could fall into a deep sleep despite everything. Today, somehow, I’m rediscovering hope. It seems like every teacher I know, and a fair number of adults who aren’t educators, are telling us to look to the kids. And the kids are stepping up; Windsor is just one of thousands of kids who refuse to just stand around wringing their hands. As one teenager said, if adults can’t do it, then we’ll just have to. I know plans are forming for a large scale national day of action, for letter-writing campaigns, for voter registration drives, for coherent and coordinated demands for specific pieces of legislation. 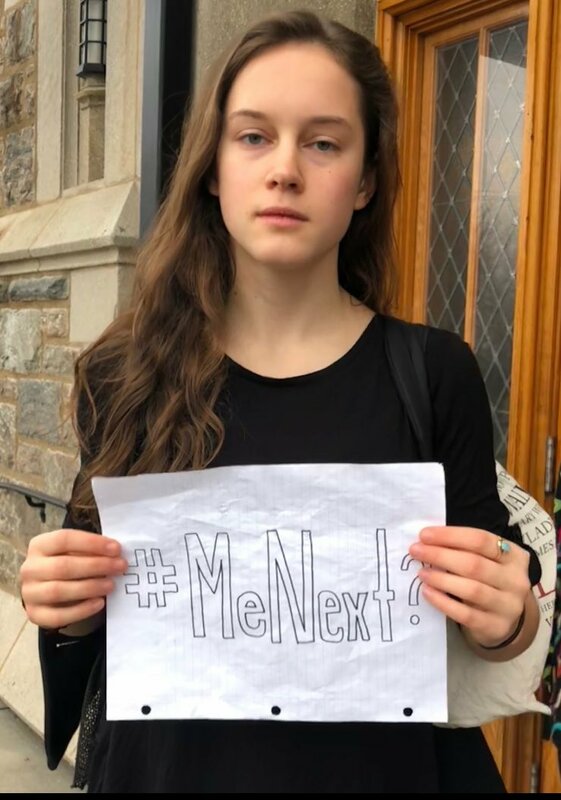 A heart-rending hashtag, #MeNext? has been spreading. The kids have got this. And we adults can and must choose to join in, supporting and working alongside them. The problem of gun violence is not going to end overnight. It’s going to be a long, hard campaign - just as with the ongoing fights to end racism, classism, and ableism, and to smash patriarchy. So has it always been with cultural progress. So must we will it to be yet again.